Will you be the one who breaks the Camel’s back? It’s been a bountiful day at the bazaar. The caravan is leaving, and you must quickly pack your items onto the back of the Camel. But beware; even beasts of burden have their breaking point! 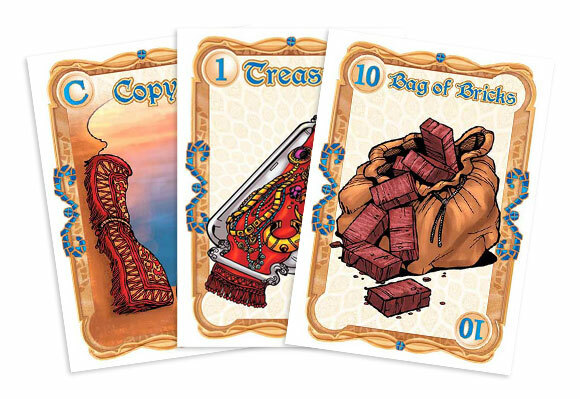 Straw is a light-hearted family game where the players try to pack as many item cards as they can on top of the Camel without breaking its back. Be careful not to load the Camel too close to its limit, though. If your card breaks the Camel’s back, you lose! But if you can break the Camel’s back with the Straw card, you win! This is an easy card game. You start with having a camel. He can take a weight of 50. You don`t want to be the one to break his back! The cards are compiled of different wights, some on the plus side, some on the minus side. Also there are some special cards that can change turn order, or make you chose how much weight you put on. A feather helps you win the game if the weight is at 50. Then you`re the only one to score. Otherwise the one who breaks the back don`t recieve points, while the others score the number cards in their hands, summing up plus and minus. It`s a fun card game, you try to throw off the others, and playing it late at night is even more fun. It is also good as a filler game, if you have just like 20 minutes to kill, and laughter is a short way away. I am always ready to sit down and play it. Not much thinking required, so if you`re tired, then it`s just that much more fun! Add a Review for "Straw"